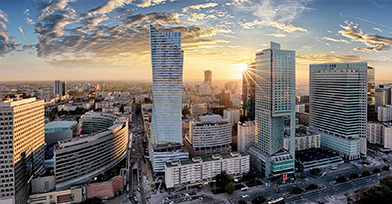 How to do business in Poland? In the investor’s practical guide we present the main rules of the game on the Polish investment market, which help European investors become successful and move with ease around the new business environment. Follow the investment path with us, step by step, to reach your goal easier and faster. The gradual development of a system of modern roads and motorways, as well as dynamic modernisation of railways and transit routes puts Poland in the heart of European economy. Do you know that an hour of work of a Swiss employee costs 60 dollars, whereas in Poland it is only USD 9? Low staff costs continue to attract many foreign investors. According to initial GUS analyses, Polish export in 2016 as compared to 2015 grew by 2.3%. The upward trend has been maintained since 2000. Poland quickly left behind the communist apathy and became one of the economic leaders of Central-Eastern Europe. Over 25 years, the country has caught up other developed countries and even exceeded many other states from the region. Moreover, Poland has come close to western states in terms of development and competes with them effectively by offering highly qualified professional staff, friendly environment for investments and low staff costs. The results speak for themselves – a stable political situation and continued political growth with an upward trend. Together, they create a good economic climate, very favourable for investing in Poland. After joining the EU on 1 May 2004, Polish law, including commercial law, was carefully adjusted to European standards. This means that all manufacturers, suppliers and buyers are protected in the same, highly efficient way. EU commercial and legal standards guarantee equal opportunities for all market participants, as well as ensure security and compliance with the law. Great variety of products and services, an absorbent market and an increasingly wealthy society of 38 million make Poland the 6th target market in the entire Europe, while the consumption level has been growing systematically for several years. According to the Central Statistical Office (GUS), the surplus in foreign trade in 2016 reached 4 billion 760 million euro. It is nearly double the amount from 2015, which was 2 billion 345 million euro. It is clear to see that Poland exports many products, services and technologies to Eastern Europe. A high increase in export has also been noted in terms of Asian countries. Between January and April 2017, the level of export to China grew to 640.1 million euro as compared to 544.1 million euro in the same period in 2016. Importantly, according to experts the dynamic upward trend will be maintained in the coming years.